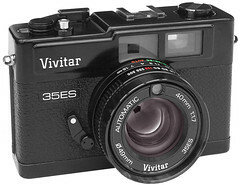 Introduced in 1978 by Vivitar, the Vivitar 35ES was a compact fixed-lens 35mm shutter-priority rangefinder camera built to Vivitar specifications and rebadged by Cosina. 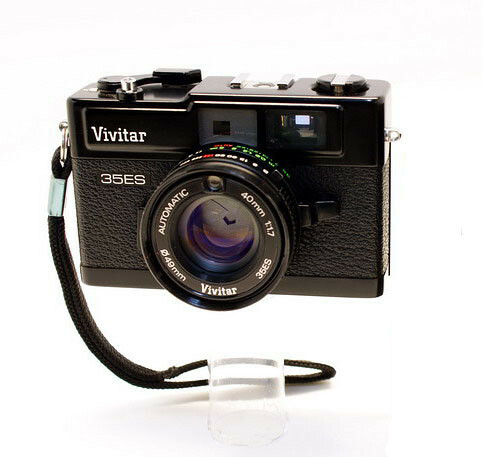 The camera is very similar in most respects to the Konica Auto S3, Minolta Hi-Matic 7sII and Revue 400SE. The 35ES has a fast (f/1.7) 40mm, six-element lens that has garnered a reputation for extremely sharp and detailed images. 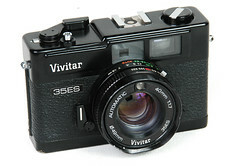 Type: 35mm rangefinder camera with shutter priority automation. Lens: 40mm/1.7, 6 elements in 4 groups. Shutter Speeds: 1/8 sec -1/500 sec., B. Exposure Meter: CdS cell located above front lens element. Exposure Value Range: EV 4.5 - EV 17. Film Speed Range: ISO 25-800. Flash Synchronization: Built-in X-synchronization at all speeds, manual flash compensation feature. Focusing System: Superimposed rectangle, rangefinder-type. Film Advance: Manual, lever operated, single-stroke. Filter Mount: screw-on, 49 mm. Battery: Single 1.35v mercury cell, Mallory PX 675 or equivalent. Dimensions: 114 mm x 60 mm x 74 mm. 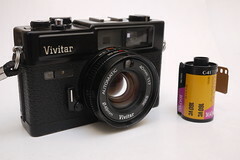 Accessories: Camera case, filters, electronic flash (Vivitar Model 125). This page was last edited on 30 October 2014, at 03:16.